(1) By Pastor Roger Estrera, adopted minister….This is my accomplishment report in my assigned place: Maragusan, Comval Province. After having our satellite groundwork, our first baptism last July 6 reaped 52 souls. After that, we conducted another satellite area in Brgy. Tuburan, in the mountain of Maragusan. There were 17 souls who accepted baptism there last July 27. Finally, we assisted the crusade of Pastor William Nacorda last August 03, we had a mass baptism of 124 souls (Total: 193 souls). My co-Adopts were: Basco, Caraballe, and Fortich. I am so glad that our ministry work was a success through God’s help and I’m thankful for all prayers and support of our sponsors. (2) By Pastor Arnel Sarona, adopted minister…Good day to and your family and may the blessings of God be upon us always. I am happy to update you with the work that God has entrusted to us. Yesterday, August 24, 2013, was the culmination of the simultaneous crusades held at Adventist Convention Center in Tiayon Ipil, Zamboanga Sibugay. Through the grace of God, there were 181 souls who accepted Jesus as their personal Savior. Though some of the candidates were not able to attend the culmination because of the typhoon, still the work was very successful. There will be another baptism next Sabbath in their respective districts. (3) By Pastor Noel Omega, adopted minister….The elderly woman in the picture is Esperanza Belonio, 83 years old. I had given her Bible studies since March 2012, and this last Sabbath July 6, 2013was her scheduled baptism, but sad to say…she had passed away one week before her baptism. We fondly called her “Pasing” who was a very devoted Roman Catholic member. After her retirement, she gave her time in supporting her church activities. She was the one who gave lectures in many Barangays in Valencia and taught the church members how to pray to the saints and Mother Mary. She was very active in church activities for many, many years. Her Children and grand children love her very much because she was very kind and always happy. Until such time when she became ill, she stopped giving lectures. When I first met Nanay Pasing, she was already bedridden, for she couldn’t walk anymore. From that moment I always visited her in her house. I gave her Bible studies. She also listened to our radio program and Bibles studies in the air. At first, she asked me to discuss the Ten Commandments because it was different from the commandments that she was taught in the Catholic Church. We had many things that we discussed about until I asked her for baptism. Many times Nanay Pasing cried for the regrets of those many years, for she taught the people the wrong doctrine. But she was very happy to find the truth while she was still alive. Nanay Pasing went to the grave with a happy heart for God called her to be His true disciple in the last moment of her life. 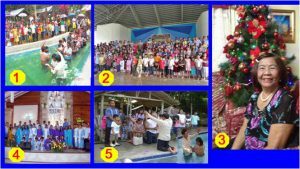 (4) By Pastor Antonio Duroy, adopted minister….Last Sabbath, Aug. 10, we had our baptism here after my evangelistic effort and praise God, 29 precious souls being baptized. Thank you so much for your prayer and support. May the Lord bless you always. (5) By Pastor Robert Guelos, adopted minister…. Mrs. Cynthia Balios has three children and has a small business in the market. Her husband was working in a poultry farm and a very devout Catholic. Mrs. Balios was a Catholic since birth. A few years back, she started to discover Bible truths that were not taught by her church. She started reading her Bible and accepted Bible study from the Baptist Church. However, she was not convinced of their teachings, so she looked for another church. She was given Bible studies by the pastors of the Alliance Church, Jehovah Witness and Iglesia ni Cristo but yet she had many questions that were not clearly answered. One day, she met a family friend who is an Adventist and told her interest in searching the truth. The Adventist member told me about Mrs. Balios. Her request for Bible study is only for additional knowledge in the Bible and to find answers to her questions. She did not ask Bible study to be an Adventist. So I started giving her Bible studies. Her husband opposed the study because he said they already have their faith. Topic by topic, we studied the Bible and every now and then her questions were answered clearly through God’s grace. Finally, she was converted by the Holy Spirit to accept Christ as her Savior. But her decision for baptism was not easy because of the opposition of her family. Her first scheduled baptism was postponed but last Sabbath according to her, God is her refuge over the trials, and she was baptized. After the baptism, tears fell from her eyes. Tears of joy that she found her salvation in Jesus. She hopes and prays that one day, her family will join her in God’s family.